The DFINITY project has kept a low profile, but there is a public network dimension and more and more questions are being asked as new information is released. The two main questions relate to the general positioning of the DFINITY network and whether there will be a “crowdsale”. Positioning. DFINITY aims to create a scalable “decentralized cloud” where smart contract software can run and is conceived as a sister network for Ethereum. The project introduces new technology including network protocols and cryptographic constructions focused on extreme performance, scalability and enterprise requirements, much of which might hopefully also be used by Ethereum or Enterprise Ethereum derivatives too. Other innovations take DFINITY down a much more experimental path — specifically “The Code is Law” is replaced by an omnipotent distributed intelligence called the “Blockchain Nervous System” that performs governance without human-controllable intermediaries. The project aims to maintain compatibility with Ethereum for Dapp developers, such that their work can run on either network, and maximize the shared code. DFINITY is not an Ethereum competitor — the introduction of the Blockchain Nervous System makes DFINITY a very different kind of proposition — but rather a sister network that broadens the EVM ecosystem making it far stronger as regards competition from more proprietary platforms, especially in enterprise markets. Considering the experimental nature of the Blockchain Nervous System, you can think of DFINITY as “Ethereum’s crazy sister”. Fundraising. 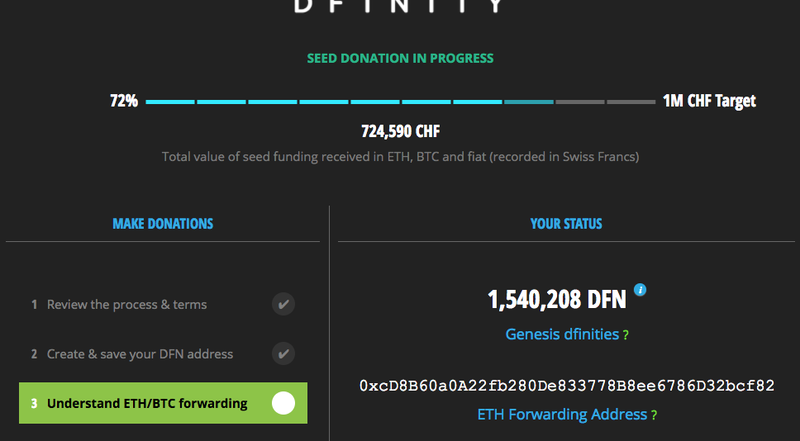 There is already a not-for-profit foundation in Zug called DFINITY Stiftung and it will raise further funds by collecting donations in public “seed” and “main” rounds. The system for raising funds is decentralized, autonomous, and already live, and involves smart contracts resident on Ethereum whose purpose is to record contributions (donations) to the foundation. DFINITY Stiftung is only able to delay the onset of the seed round some maximum number of times by calling into the autonomous systems, and therefore it will inevitably begin soon. Once the initial “Copper” release of the DFINITY client is judged sufficiently mature, it is the intention of DFINITY Stiftung to recommend to the mining community that they launch a network that derives its genesis state directly from these smart contracts on Ethereum (and thus that DFINITY boots off Ethereum) and that initial allocations of “dfinity” participation tokens reflect the contributions that recorded as having been made. Two critical points are: the funding rounds for DFINITY Stiftung are not intended for speculators nor suitable for speculation, and furthermore the USA is blocked due to regulatory uncertainties. The aim is to maintain complete compatibility with the EVM — if your Dapp works on Ethereum, it will work on DFINITY too. DFINITY creates a “decentralized cloud” for smart contracts that focuses on three main areas: extreme performance and scaling on public networks, the integration of private and public networks, and public governance without human intermediaries. The Copper release will also include the Blockchain Nervous System. This will handle all further upgrades and releases, and control economic parameters, among other things. DFINITY is very different to “Code is Law” systems such as Bitcoin or Ethereum, and everything is subject to the distributed intelligence (read more to understand). The DFINITY project can be traced back to 2014. The purpose of the research was to deliver network protocols and cryptography that can generate infinitely scalable decentralized virtual computers that might host open versions of critical infrastructure such as Uber, eBay and even Web search. The protocols involved are all predicated on the assumption they need to support a peer-to-peer network of a million or more mining clients — but simplicity, understandability and verifiability are strongly prioritized. We also prioritize the creation of private decentralized clouds where smart contact software can directly call into smart contract software on the public DFINITY decentralized cloud network. The creation of “mining identities” by making security deposits. The creation of “neurons” (part of the BNS) by making security deposits. The attachment of private cloud networks to the public DFINITY network, again via deposits. DFN tokens mediate access to the resources of the virtual computer produced by DFINITY’s decentralized network protocols. If participation was not mediated in this way, it would be trivial for an adversary — or rogue software such as a computer virus — to consume the network’s resources and deny access to honest users. For such reasons, a decentralized network such as DFINITY cannot exist without its own native participation tokens. Because the DFINITY network depends upon independent parties holding DFN tokens to function, initial allocations must exist in the genesis state. As described in the foregoing, autonomous smart contracts installed on Ethereum will collect contributions towards the operation of DFINITY Stiftung in forthcoming “seed” and “main” rounds. When DFINITY Stiftung later judges that the Copper Release DFINITY client software is sufficiently mature that the public network can be launched, it will recommend to the independent worldwide community of miners that they use a client version that boots itself of Ethereum by applying the data in these smart contracts to construct the network’s “genesis state”. The genesis state will include initial allocations of DFN derived from the contributions recorded as being made during the fundraising rounds. The intention is that DFN tokens are not used for speculative purposes although of course eventually it will be useful for network security if they gain value. For game theoretic reasons, the DFINITY network will be best served if only those actually wishing to participate in the network — for example by creating neurons or running mining clients — initially acquire DFN through making contributions to DFINITY Stiftung. For this reason, we ask that speculators stay away from the upcoming fundraising rounds. You should only contribute money to DFINITY Stiftung if you are fundamentally interested in the technology being released and the public DFINITY network (“the decentralized cloud”) being launched. If you contribute money, you should be aware that there is no guarantee that the independent worldwide community of miners will later heed the recommendations of DFINITY Stiftung to use the autonomous Ethereum smart contracts as the basis for DFINITY’s genesis state (thus materializing the DFN allocations you expected). Furthermore, even if you feel confident this will work out, please remember that DFINITY involves a lot of experimental crypto that is unproven and the network might fail completely such that your participation tokens are valueless anyway! If you are a speculator or unsure, just stay away from the fundraising!! It is crucial to understand that DFINITY Blockchain Nervous System is essentially omnipotent within the network. The EVM (Ethereum Virtual Machine) has been extended with special privileged instructions that only it can access. These enable it to modify economic parameters such as the DFN rewards issued to miners and neuron operators, to freeze “rogue” smart contracts, redistribute DFN and even run arbitrary smart contract code in privileged mode — for example to fix hacks such as The DAO . In our view, there was little purpose in limiting the power of the BNS since it can anyway upgrade the protocol (this is done in a manner that is transparent to Dapps and users) and through this can grant itself arbitrary powers anyway. This makes DFINITY very different to traditional blockchain systems such as Bitcoin and Ethereum. The BNS makes decisions by either adopting or rejecting proposals that have been submitted with a fee in DFN. Clearly, since anyone can submit proposals, if the BNS “goes crazy” or even simply shows a tendency to adopt unwise proposals, the consequences for the network will be severe. There will also be little opportunity to understand the problem since the decision making process of the BNS is opaque and non-deterministic. This is another reason why speculators should steer clear of DFINITY: nobody knows what will happen. However, careful design choices have been made to increase the likelihood the BNS makes good decisions. The Blockchain Nervous System makes decisions through the interactions of “neurons” that follow each other, which are operated by special client software running on the edges of the network. To create a neuron and receive “thought mining” rewards, a security deposit in DFN must be submitted to the BNS on-chain (the voting power of a neuron is proportional to the deposit size). Such deposits can only be retrieved by dissolving the neuron which takes many months. This is what provides emotion. Whenever the BNS makes a bad decision, the markets will react very swiftly to punish the value of dfinities. This will hurt the value of the of holdings of neuron holders, who should then reconfigure the follow relationships of their neurons so that better decisions are made in the future, enabling the BNS to learn and improve. The dopamine of the BNS is thus released upon the production of good decisions that drive up the value of dfinities, and the driving emotion and objective of the distributed intelligence is to maximize network security, efficiency and adoption in ways that drive up their value. Read the article on the Blockchain Nervous System to understand how this works in detail. Of course, it is unknown whether token markets can succeed in helping the Blockchain Nervous System make consistently good decisions. It is important to understand that this will be crucial to determining the success of DFINITY as a public network. One of the challenges in launching open decentralized networks is that must be created through the efforts of an independent community of miners and, in the case of DFINITY, neuron operators. But although the participants are independent, the overall ecosystem of miners, neuron operators, application developers and end users can benefit from the support of a non-for-profit organization in much the same way that Internet users benefit from the efforts of ICANN. This is is the purpose of DFINITY Stiftung, a not-for-profit foundation based in Zug. DFINITY Stiftung has already received some initial funding from its kind founders who hope to use the DFINITY network themselves and are interested in the open source technology contributions the project is making. DFINITY Stiftung will primarily dispense funds to researchers and developers working on DFINITY and Ethereum (since the project aims to maximize shared code, it is anticipated that a large proportion of foundation funds will be directed to supporting Ethereum project efforts). The foundation will work with partners to help try and birth a second public network operated by miners in China called Dragon DFINITY. The purpose of supporting a separate Chinese network is to avoid importing performance limitations created by the Great Firewall, and to allow customization of the Blockchain Nervous System configuration in consideration of special requirements of the Chinese government. The network will be created with the help of Chinese partners, and DFINITY Stiftung will aim to negotiate a launch format that benefits those holding normal dfinity tokens at genesis. The foundation will prioritize strong open governance and the efficient deployment of funds. A key objective of DFINITY Stiftung is to eventually dissolve itself in favor of the Blockchain Nervous System. We believe it will be some years before this is possible though (since having the BNS develop, promote and dynamically adapt strategy and perform tasks such as lobbying or running events via proxy persons is substantially more complex that simply adopting and rejecting proposals as occurs in the current design). DFINITY Stiftung will use its 12.5% endowment as needed, for example making disbursements to those making contributions to the project, and/or liquidating tokens to assist with other funding needs. The 9.5% allocated to the pre-seed round reflects that many of the early contributors participating have performed years of research without pay, and/or have lent substantial resources to help incubate the project and bring it to where it is today. The remaining vast bulk of the dfinities (78%) allocated at genesis will then be for those participating in the forthcoming seed and main rounds. Although contributions will be mainly made in ETH and BTC, the seed and main funding rounds have “soft” caps measured in Swiss francs of 1M CHF and 20M CHF respectively. The caps are soft because if they are reached, the smart contract systems on Ethereum will only stop collecting additional contributions after a delay of 24 hours. The purpose of using a soft cap is to prevent a whale or small group of whales consuming the entire allocation of DFN that will be created by making a large contribution, which would not only be unfair but undermine the decentralization and security of the network upon launch. The smart contracts try to reflect the reality that those contributing in the seed fundraising round have a greater risk of later finding that they have donated to a failed project by applying a multiplier of 3X. Simply put, currently the DFINITY project only has some years of research and various software PoCs, for example a version of the EVM with special op codes (instructions) for the BNS, and BLS threshold encryption software and simulations of Threshold Relay chains and Feldman DKG in Go and C++ that prove and confirm its performance properties. Those contributing in the seed round are really contributing towards a very well researched concept — and this of course is totally unsuitable for speculative purposes, and only suitable for those that wish to see DFINITY Stiftung complete its implementation work. The smart contracts use a base measure that 10 DFN will be allocated per CHF, and then apply the multiplier. So the idea is that those making contributions in the seed round will receive 30 DFN for each CHF (if the project goes to plan and the independent community of miners worldwide accept the recommendations of DFINITY Stiftung). Thereafter, the main round will begin with a multiplier of 1.25X which then decreases in steps over 6 weeks until the multiplier is just 1X. The reduced multipliers involved in the main round reflect that it is expected to take place after a beta of the Copper client has been released and a test network is running. After the main round is finished, the smart contracts automatically perform processing of the contribution receipts such that they are ready to form part of the genesis state. Participation in the seed and main rounds involves installation of a special Chrome extension that talks to the Bitcoin and Ethereum networks and “forwards” contributions. Using this extension, you will be able to make contributions directly from token exchanges. Of course, participation will be entirely at your own risk, and you must make contributions purely for the benefit of DFINTY Stiftung and accept total loss of all and any value involved. A small number of parties directly linked to DFINITY Stiftung will (or have already) made donations in CHF.